Trainer Jack Sisterson had an ideal scenario in mind for how Oxy Lady would work on Saturday morning and it couldn’t have gone any smoother. The Calumet Farm-owned daughter of Oxbow will attempt to shoot for her second graded stakes victory in the Grade 2 $200,000 Rachel Alexandra Stakes. A Kentucky homebred, Oxy Lady went a half-mile in 48.20 for Sisterson, which was the 13th fastest of 135 recorded workouts at the distance. 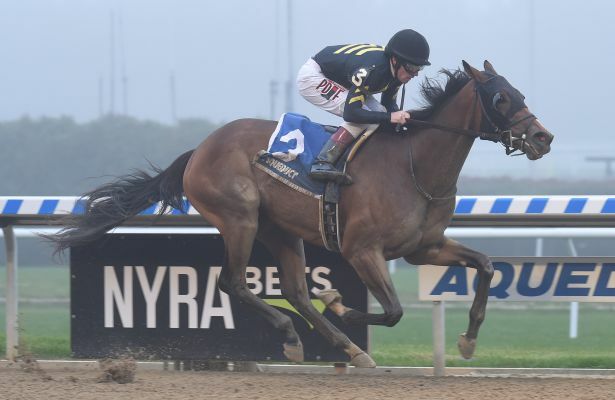 She gave the trainer his first graded stakes victory when taking the Tempted Stakes (G3) at Aqueduct last November. Never worse than fourth in five career starts, Oxy Lady has raced over five different ovals in each of her starts, the most recent of which was a fourth-place effort in the Starlet Stakes (G1) at Los Alamitos Race Course behind fellow Rachel Alexandra Stakes contestant Chasing Yesterday. Sisterson currently has a string of nine horses on the Fair Grounds backstretch and has made quite a showing having won two of his seven starts, which also include two seconds. Oxy Lady will break from post six under jockey Adam Beschizza. Out of the graded stakes placed A.P. Indy broodmare Renaissance Lady, Oxy Lady comes from the same family as 1982 Champion Sprinter Gold Beauty who became the broodmare of prominent sire Dayjur and Grade 1 winner Maplejinsky – the dam of multiple Grade 1 winner Sky Beauty.